Grant Associates is part of the design team that has helped secure outline planning permission for the University of Bristol’s new Temple Quarter Enterprise Campus – a significant milestone in the long-awaited regeneration of this prime city centre site. The design team includes architects Feilden Clegg Bradley Studios and Allford Hall Monaghan Morris, engineering consultants Buro Happold and Arup, and landscape architect Grant Associates. 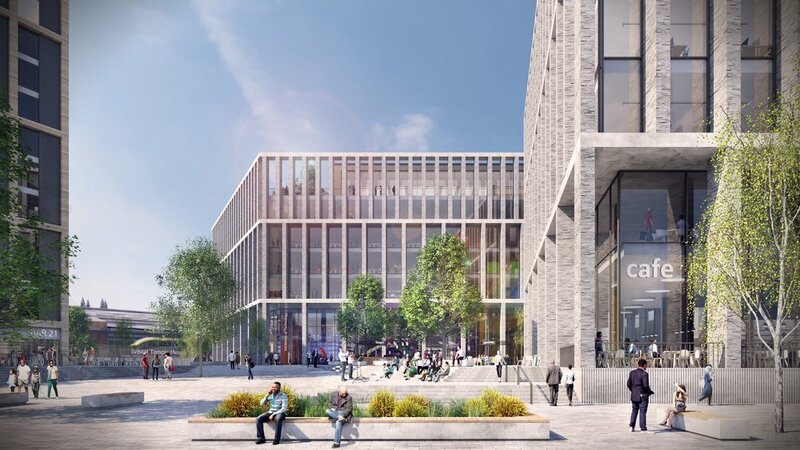 The team was commissioned by infrastructure consultancy Aecom to develop a masterplan for the new campus that covers a seven-acre site next to Bristol Temple Meads railway station. Spanning the derelict former Royal Mail sorting office and part of Arena Island, the campus will provide teaching, research and innovation space for around 800 staff, external partners and 3,000 students, with accommodation on site for up to 1,500 undergraduates and postgraduates. The brief for the masterplan was to create an open and welcoming campus for students that will also benefit the wider community. Members of the public will be encouraged to use new public spaces within the development, including the waterfront onto the Floating Harbour, cafes and shops, and well-connected walking and cycling routes. The campus, which aims to open in 2021/22, will be at the forefront of digital and management research, education, skills and innovation. Outline planning permission covers the proposed density and scale of the scheme’s buildings, as well as access to the site. Specific details about the appearance and layout of the new campus will be submitted at a later stage of the planning application process. "The design team is tasked with delivering a world-class centre for education, research and innovation right next to Brunel’s iconic station. We are excited by the special landscape and public realm design opportunities for this site. This is a key development not just for the University of Bristol but for the city’s businesses, residents and visitors. Our aim is to fulfil the University’s vision of creating a welcoming campus that also offers inspiring public spaces and takes full advantage of its waterfront location." Notes to editors: Right click on image below to download high res version.